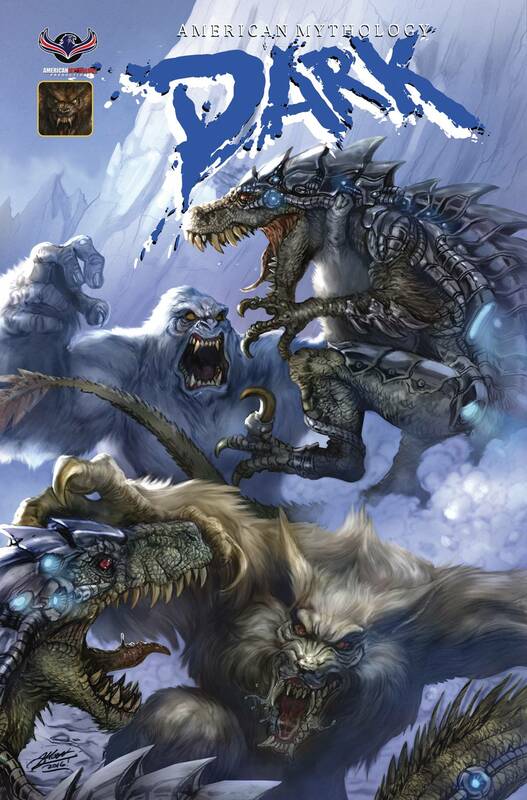 American Mythology Dark is back with a brand new chapter in the bombastic sci-fi horror tale Werewolves vs. Dinosaurs! Cade and Smith have been transported through a portal into a strange and deadly new realm. Now these unlikely allies need to get back to their own world, despite being hunted by ferocious Werewolves and Dinosaurs. And their temporary reprieve from danger is an illusion. The mysterious Trench and his cowboy mercenaries are still tracking them and they are on the cusp of being caught in a horror free-for-all between Werewolves, Dinosaurs, and the legendary Yeti! 2016's surprise over-the-top sci-fi and monster mash up is back with even more unpredictable twists and turns!